I am here on behalf of the Emergency Coalition Against Austerity and the affinity groups to which I belong: Tax Fairness Oregon and Oregon Save Our Schools. The foremost reason this committee should oppose the Economic Impact Investment Act is because secret deals are decidedly undemocratic. The democratic process demands a thoughtful debate. Having a public hearing to both introduce this bill and its amendments will not allow this. But I will elaborate further on why this bill is bad. According to classical economic theory, Say’s Law states, “Supply creates its own demand.” Accordingly, profit-seeking businesses will hire job seekers willing to work for a wage that doesn’t exceed their productivity. Oregon businesses that hoard their profits in offshore shelters and pay their executives exorbitantly disrupt supply and demand. Why should Oregonians support tax favors for these corporations, especially when under- and unemployed Oregonians can’t buy their products? Tax expenditures require only a simple majority vote. Raising revenue is far more difficult since a 3/5-majority vote is necessary. If there is a silver lining to this special session, it’s that that Oregonians are beginning to understand that corporate tax loopholes are trade secrets. Favorable tax policy yields returns on investment for which the tax accountants and attorneys are well paid. According to the most recent data available, the New York Times estimates Oregon spends at least $865 million per year on incentive programs. Where are the clawbacks and penalties for corporations that don’t keep up their end of the bargain? For that matter, what is their end of the bargain? It’s worthy to discuss proposed amendments as global remedies to address tax fairness. Oregonians need to know how this bill defines new job creation and sets quality standards. These metrics must be reported in an easily accessible manner. Reporting and disclosure must be thorough and include a summary of the corporations’ total taxable income and amount of taxes paid in Oregon. Any provisions of this Act deemed unenforceable in a court of law should not affect the validity or enforceability of other provisions in the Act. Oliver Wendell Holmes, Jr. famously said, "Taxes are the price we pay for civilization." Unjust tax policy can be an act of barbarism. p.s. I apologize that the reader cannot "see" links to the amendments. They are simply not available. Finland is number one in the world when it comes to public education. And all of Oregon's leaders, parents, teachers, and students should be asking why. Oregonians seem to want more Finland, less No Child Left Behind, and less GERM. This is supported by hearing and reading the public testimony made in response to the state's Education Funding Team (who, by the way, met in secret rather than in public to make their list of priorities). Community voices mentioned small class sizes, strong school libraries, the importance of counselors, well-rounded education, less if not disappearance of standardized testing, affordable college tuition, and adequate funding. In other words, more like Finland. "But in a series of public hearings on those ideas, parents, educators and others mainly ignored those strategies. Instead, more than 1,000 testified, and overhwhelmingly, they complained about big classes, high tuition, lack of counselors and many other things they see lacking in their schools and colleges." The real questions that should have been at the forefront of any financial decision should have been this: how much of the funding is going directly into our children's classrooms and schools to effect learning and benefit kids. What are successful school models like Finland doing and what can we learn from them? What does our public want and how do we fund it in a stable way? How do we "take care of our own"? Instead, none of this is found in Kitzhaber's plan. Instead the Governor wants to have districts compete for money and prove what supposedly 'works.' Which then begs the question, "How is "what works" measured?" Currently, for most students up until later in high school, it is standardized tests, and with the new Common Core State Standards, this will cost the state even more money. Why not trust teachers to develop and judge assessments for their students? "He (Kitzhaber) said the money won't necessarily be spread evenly on a per-student basis, as most Oregon school funding is. He said school districts might have to compete for grants or that his chief education officer, Rudy Crew, might make discretionary awards." "First of all, although Finland can show the United States what equal opportunity looks like, Americans cannot achieve equity without first implementing fundamental changes in their school system. The following three issues require particular attention. Funding of schools: Finnish schools are funded based on a formula guaranteeing equal allocation of resources to each school regardless of location or wealth of its community. Well-being of children: All children in Finland have, by law, access to childcare, comprehensive health care, and pre-school in their own communities. Every school must have a welfare team to advance child happiness in school. Education as a human right: All education from preschool to university is free of charge for anybody living in Finland. This makes higher education affordable and accessible for all. As long as these conditions don’t exist, the Finnish equality-based model bears little relevance in the United States." "We could learn a thing or two from a country that consistently beats us on all those tests we seem to care so much about: Finland. Finland has local control with national funding. The poorer the district, the greater the national funding. Finnish education encourages local experimentation by freeing local districts to focus on education rather than fundraising." The other insult to the teaching profession, and other public employees, is the Governor's insistance that the funding will only work if there is reform to the Public Employees Retirement System (PERS). What about corporate tax reform instead? The state cannot continue to try to create a budget on the backs of its public employees. How is that good for our economy and public education? In Finland, teachers are highly-trained, treated with respect, paid adequately, and are trusted to educate the children of their country. Our Governor is clearly out of touch with the voices of the community who strongly opposed the Education Funding Team's recommendations on funding priorities. Rather than ask the experts such as teachers, parents, and students, Gov. Kitzhaber has surrounded himself with voices of the business community to make education policy decisions. He feels Oregon's education system has to prove its worth to the business community instead of the other way around. 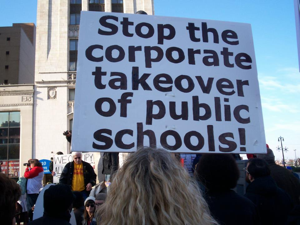 Our public education system is being set up for a corporate education reform takeover. Time is running short, and we have to take it back. It will take us contacting our legislators and demanding a resounding 'NO' most of the the Governor's recommendations. We need to remind our Governor that this is a democracy, and he won't take our public education system without a fight. And we want more Finland because they get it right. Why Teachers Give Race to the Top an "F"
The Portland Business Alliance , The Oregonian Editorial Board, and the Portland School Board have lined up to denounce Portland teachers for refusing to sign on to the district's Race to the Top application. While they all claim to support Portland students, they are backing policies that would further deepen inequity and worsen educational experiences. All of these editorials misleadingly leave out the fact that the Race to the Top grant cannot be spent to hire teachers or help with class sizes but instead must be dedicated to areas like professional development, which further adds to teacher workload, while not solving any of the real problems in our schools. They also claim that the Portland Association of Teachers refused to collaborate with district administrators in crafting a Race to the Top Application and The Oregonian holds up Hillsboro as a model of collaboration. But both the Portland Association of Teachers and the Hillsboro Education Association told their district officials that they would only collaborate on an RTTT application if it did not include tying teacher evaluations to student test scores. The only difference is that Hillsboro administrators agreed to collaborate with their union, while Portland officials did not. Rather than craft a RTTT application based on the hundreds of places where we agree, the school board insisted on including the one thing we disagree on—tying teacher evaluation to student test scores. So why are teachers opposed to tying our evaluations to test scores? If you've been reading Oregonian editorials you would think that we’re doing this because teachers don’t want to be held accountable and that those who dedicate their lives to working with children also happen to want horrible educational experiences for them. This couldn’t be further from the truth. Contrary to what these editorials have claimed, while state law currently mandates that “student growth” be part of teacher evaluation, the district’s Race to the Top application would take this one step further by implementing a value-added evaluation model that would label teachers “highly effective,” “effective,” or “not-effective” based on their students’ standardized test scores. Several studies have shown that value-added models are highly unstable. Up to 35 percent of teachers move from being labeled "highly effective" one year to "not-effective" (or vice versa) the next. But our stance against Race to the Top isn't just about rejecting an error-prone model of evaluation. It's about standing up for students, because our working conditions are students’ learning conditions. Students will be hurt by further emphasis on standardized tests and by punishing good teachers who-- for reasons often outside of their control-- cannot improve their students’ standardized test scores. Because standardized tests tell more about a student's zip code than their academic ability, this model of test-and-punish unfairly labels public schools—and its students, parents, and teachers—as failures. The single most important factor contributing to low student achievement is poverty. Study after study has shown that there is a strong correlation between family income and test scores. Those who have wealthy parents are at the top, and low-income students are at the bottom. Evaluating teachers based on student test scores punishes teachers who choose to teach the least fortunate. Even value-added models that try to take into account student’s prior achievement assume that all students will improve at the same rate. This does not hold true for English Language Learners, students with disabilities or others who have traditionally performed poorly on tests. And while teachers can play a crucial role in student success, evaluating teachers through standardized tests assumes that teachers can overcome any obstacle in students’ lives. But as educator Jesse Hagopian writes, "a student whose home is foreclosed on will not be able to do their economics homework. A student whose loved one has been killed in a war in the Middle East will have a difficulty connecting with the science teachers’ attempt to bring alive the learning of human body systems. A student whose parents have been deported will have difficulty crossing the barrier of the parent signature needed for a field trip to the civil rights museum. A student with parents who have been laid off may see their dream of going to college deferred for lack of funds. A student whose family lacks affordable health insurance may find themselves chronically absent from health class." Societies ills don’t magically disappear the moment a student enters a school. Race to the Top’s evaluation model isn’t about measuring teacher effectiveness, but driving a political agenda that weakens teachers’ job security, puts even more emphasis on standardized testing, and attacks teacher unions and public schools. The $400 million in RTTT funds that are being offered to districts is less than 1/25th of what Wall Street gave out in bonuses in 2011. If the federal governments can bailout the banks with virtually no strings attached, why can’t they fully fund our schools? And at the state level we need real revenue reform. Oregon has a regressive income tax and one of the lowest corporate taxes in the nation. Yet in 2010 both the Oregonian and the Portland Business Alliance urged a "no" vote on Measure 66 and 67, that temporarily raised taxes on the rich and corporations to fund our schools. It's clear that they only want money for our public schools when it doesn't inconvenience wealthy Oregonians. We need to demand progressive income and corporate taxes that fund quality public education for all and aren’t attached to biased standardized test scores. Where Our Money is Going--Not to Kids! Of course, funding is an issue, but where's the money going? Earlier this year, Governor Kitzhaber appointed an “Education Funding Team” to recommend investments in public education. The Team has now unveiled a set of recommendations crafted in six secret meetings, under the direction of a covey of highly-paid private consultants. Kitzhaber ordered the Funding Team meetings to be closed to public scrutiny. (Salem Statesman-Journal, June 9, 2012). The Oregon Education Investment Board has now held six “public forums” around the state to get public reaction. Reaction has been overwhelmingly incredulous and negative. $225,000 ----that’s the amount of the private consultants’ generous state contract to run the 6 secret Funding Team meetings to craft the recommendations. That’s a per-meeting consultant cost of $37,000! Want another number? $300----that’s the allowable per-hour consultant rate under this state contract. “$100,000 and up”---that’s the salary level of five of eight of the new state bureaucrats hired by “Chief Education Officer” Rudy Crew Remember also that Crew’s salary is $280,000 per year plus an unbelievably generous array of benefits. $50 million”---that’s the Funding Team’s recommended “investment” in a state-run “longitudinal data system” that is incomprehensible---even to the Investment Board! Maybe it’s incomprehensible because the system is being designed by highly paid and out-of-touch consultants. Gov. Kitzhaber and Dr. Rudy Crew need to listen to the voices of those who work closest to kids as well as the students themselves. Based on testimony from around the state, such voices are clearly advocating for a much different set of priorities than what is coming out of the OEIB Funding Team. We need to hold them accountable for what we want for OUR public schools. Contact your legislators and tell them you are concerned. Many voices of the public spoke to these issues--issues the Education Funding team are ignoring: class size, well-rounded programs such as library media specialists, art, music, PE, drama, and sports; more authentic assessments rather than high-stakes testing, no need for tracking student data--students are human beings, not numbers; more resources for our teachers, wrap-around services to help alleviate the effects of poverty, best practices in ELL and SPED services, and make college affordable! Money should be going into our kids' classrooms not in the pockets of more bureaucracy! Here is the official testimony from an Oregon teacher regarding the funding priorities set forth by the Oregon Education Investment Board at their Salem public forum. Pat Muller teaches English Language Learners (ELL) and is concerned about the impact the OEIB priorities would have on her students. I have been monitoring your public hearings about investment in education. It’s disappointing that so few of the Board members actually attend these meetings. I’m hoping to see a summary of these meetings posted from which you have been universally receiving negative feedback about many provisions of the funding plan for which you will probably move forward despite the fact of complete lack of transparency and public support. You eloquently state that we will no longer have an achievement gap, yet your proposal only serves to reduce the funding necessary to provide services to special education students and English language learners. While class size increases across the state, expenditures increase for data collection, high-stakes testing, and new regional centers where mentors will show teachers how they can work even harder with fewer resources and achieve even better results. We have come a long way from the days when anyone with an Hispanic surname was classified as ELL and funds dispersed to districts. We now have procedures for identifying ELL students and monitoring them throughout the process. What is still lacking is accountability for how this money is spent. The money should be spent exclusively on services that directly benefit ELLs. Examples include: ELL specialists, ELL teaching assistants, professional development, intervention staff, translation services (to be supplemented from the general fund for students not classified as ELL but whose parents need services), ELL TOSAs to assist general education teachers in meeting the needs of ELLs outside of ELD class, and district office support for ELL staff. ELL money should not be spent on anything that should be funded out of the general fund, including Spanish instruction for English speakers in dual immersion programs. Before we throw the baby out with the bathwater, we need a reporting method where districts are responsible to show that the money is being spent for its intended purpose. Only then, and with a transparent public process, should we look at how to more effectively fund and manage this budget. The majority of districts are not meeting AMAO which has targets for: percentage of students moving up one proficiency level, percentage of students exiting the program, percentage of long term (>5 yrs) who are exiting the program, and percentage of students passing the OAKS reading and writing. Why is this happening? It is happening because the targets are not research-based and unattainable. And from this, we will be labeled as a failure. The proposed ELL block funding will harm students. Districts will be pressured to exit students before they are ready as general fund resources diminish. Students on the margin of any exiting decision will also be exited. You can’t claim we are over serving students. If that were true, our achievement numbers would look drastically different. Many students come to kindergarten speaking no English. So let’s say we are given 5 years of funding. Students would have to be exited before they enter middle school. Looking at the statewide achievement of ELLs at the middle and high school levels (dismal), we will no longer have funding for a program at those levels. *And since they will have been exited and are no longer classified as ELL, then VOILA!! We will have no achievement gap because the students will have been classified as general population! Good job Oregon! Both middle and high school ELL programs would cease to exist under the proposal, except for a skeleton program for newcomers. Districts would retain the responsibility after the funding has run out, yet another unfunded mandate. In the middle of a school financial crisis across the state, this is the wrong time to reduce funding for our at-risk students. The proposal states that there are places where students are exiting faster than the state average, implying that this could happen everywhere. Where exactly are these places and how did they do it? Would they be able to continue to do it under the new funding formula proposed? If you were disappointed with the number of sick people in a hospital, then pushing them out the door would not help. Saying that students who previously had to jump four feet now have to jump five feet doesn’t do a thing to get them over the bar. I am an ELL teacher in a model elementary school. I guess that makes my testimony suspect as my job probably wouldn’t exist under the new funding proposal. I could always get another job, maybe working for the high-stakes testing industry, where there seems to be a large influx of money. But in the meantime, don’t mess with my students’ opportunity for a future, because this won’t happen on my watch. A teacher in Coos Bay sent this report along to Oregon Save Our Schools as he/she attended the Coos Bay OEIB Funding Priorities Forum. What is clear is that the public was not supportive of the OEIB plan and again feel that the state needs to get back on track to having a serious discussion about how we will fund our schools and provide a well-rounded education. There were about 80 people there. I think 32 spoke out. It was cordial, but people spoke their minds and the audience (usually) clapped when the speaker was finished speaking. There were no outright positive comments about the board and their work. A couple people thanked them and said they had a difficult job. Hi, I’m Teri Harris Jones, a member of OSEA and current chapter #33 president. I am also a library media clerk for Madison Elementary School. 1. I believe education employees are our greatest resource. To achieve success with any initiative, to meet any standard, we must have a strong workforce, certified and classified. Tonight I’m speaking on behalf of my hundred plus classified employees. The loss of adequate education funding has been responsible for position cuts, reduced hours, benefits and professional development opportunities for classified employees. Classified positions include maintenance, secretarial, accounting, Special Ed, E.A.’s, speech path assistants, and library media clerks. In some districts, food service and transportation are included. A school district cannot run efficiently without us. Our students deserve to be served by a classified workforce that is primarily comprised of 40 hour a week employees that are part of their schools professional learning community. 2. The second issue I want to address is School Libraries. THEN ADEQUATELY FUND AND STAFF SCHOOL LIBRARIES!